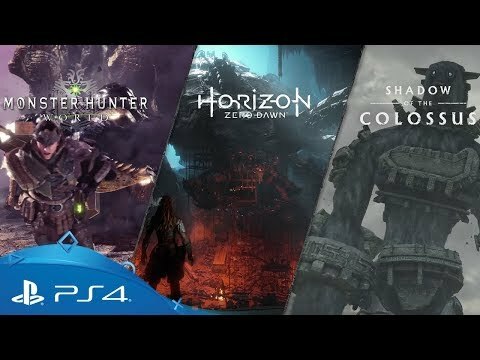 Whether it's, ancient colossi, laser-shooting mecha-dinos or monstrous fire-breathing lizards, PlayStation 4 has everything your inner hunter needs. Tie down down a giant storm-bird in Horizon Zero Dawn, fell a monolithic titan in Shadow of the Colossus or pit yourself against a razor-toothed raptor in Monster Hunter: World, all from the safety of your couch. Strap in as we take a closer look at some the fearsome foes that await you in our Monsters of PlayStation line-up. Set forth onto an undiscovered continent teeming with some of the most terrifying beasts in gaming history. As an elite hunter of the Research Commission, it'll be your job to track, observe and bring down this new world's most monstrous beasts. Small but very bold, this slender subspecies of 'fanged wyvern' prowls the thick undergrowth of the new world in marauding packs. Though they pose limited threat by themselves, in numbers, they can quickly overwhelm even experienced hunters and have been known to attack other creatures many times their own size. A fearsome and highly venomous subspecies of 'bird wyvern', this winged lizard is an incredibly formidable beast. Able to spew deadly toxins from both its mouth and tail, it is more than capable of standing its own ground and, even when cornered can take flight and find refuge in high jungle canopy. Hulking, bipedal and heavily armoured, this common species of 'brute wyvern' is notable not only for its monstrous size, but for the bony mantle that surrounds its head. Highly resilient, the Barroth is known for charging enemies with its plough-like head, crushing absolutely eveything in its path. Want to know more about Monster Hunter: World? Race across the barren wastes of the Forbidden Land on horseback, following the light of a mysterious ancient blade as you seek out 16 ancient collosi. Only by felling these mighty titans can you summon the power to resurrect a lost love. North from the Shrine of Worship, hidden in a desert cravasse, lies the 11th colossus. Known to some as Celosia, this small but sturdy creature is highly aggressive and will charge enemies head on the moment they set foot inside its temple. Only by leading it outside might you hope to best the little brute. In an abandoned temple to the south-east of the Shine of Worship lurks a spiny, fire-breathing lizard known to some as Kuromori. A stubborn and rebellious beast, it will climb the walls of its high chamber and spew fire between the open pillars. Keep your distance and use cunning to overcome it. Away to the east and perched above a hidden lake, the 5th colossus waits. Known to some as Avion, this huge winged creature - thorny-backed and fiery-eyed - soars high above the water, taking swooping shots at unwanted visitors. Your only chance is to lure it towards the ground, grab a hold of its thick pelt and ride the beast into the air. Ready to face the towering colossi? Want to know more about Shadow of the Colossus? Take on the role of a determined outcast and fight your way through a future landscape over-run with dangerous machines. Hunt entire herds of mechanised creatures, dig into the ruins of the old world and come face to face with a harrowing past. A small but tough pack hunter, the scrapper's jaw is fitted with viscious grinding discs designed to cut through even the hardest steel plating. Equipped with offensive lasers for warding off predators, your safest bet is to target their shoulder-mounted radar units or rear-mounted power cells to bring them down swiftly. A highly-aggressive, combat-focused unit, the Sawtooth boasts incredible strength and agility, able to close distance on an enemy in seconds. In close quarters, its razor sharp claws are lethal, unleashing furious swiping lunges and crushing charges. Keep your distance where possible, use fire to weaken its armour and if you can, ignite the blaze canister strapped to its underbelly. A dirt-surfing titan, this gargantuan, underground beast is one the most formidible you'll face in Horizon Zero Dawn. Fitted with razor-sharp grinding jaws that can spit hails of rock or erupt from the ground to tear your legs from under you, the rockbreaker is truly terrifying. Target its paddle-like feet to keep it above ground or ignite its abdominal fuel sack for major damage. Ready to reclaim the planet? Take down the biggest beasts on PlayStation in crystal clear ultra-HD resolutions, with improved performance and visuals.